The Lynx are expected to announce Saturday that next year's All-Star game will be in Minneapolis. How Tina Charles saved the life of a man she'd never met. Natasha Cloud and a voice that carries. Lynx rookie Alexis Jones deserved more time this year, acknowledges coach Cheryl Reeve. Mechelle Voepel makes her picks for the league's top three teams. Michelle Smith has some great regular-season memories. The Big 12 has released its conference schedule. Top prospect Jordan Nixon carries powerful memories into her promising future. The Wings edged the Sky, 99-96, to clinch their first playoff spot since moving to Dallas. The Lynx used a strong fourth quarter to top the Fever, 80-69. It's their seventh 25-win season and they are now one game ahead of the Sparks in first place. Who will get the eighth and final playoff spot? The Storm, the Sky or the Dream? Planned Parenthood Pasadena and the LA Sparks have partnered on a breast health awareness campaign. The Lynx announced playoff semifinal dates at "The Barn." Struggling Minnesota could lose their No. 1 seed to Los Angeles. Tiffany Jackson-Jones beat breast cancer and is inspiring the Sparks. Why Sylvia Fowles should win MVP. Simone Edwards: the story of the Jamaican Hurricane. WNBA players are raising money for Hurricane Harvey relief. Sunday is for Houston in Phoenix. Brittney Griner on Hurricane relief efforts. Freshman guard Haley Troup is leaving South Carolina and will transfer to Missouri. Stony Brook transfer Davion Wingate has landed at FGCU. Wisconsin's Kendall Shaw gives a first-person account of Hurricane Harvey. Last fall the WNBA Finals came to Staples Center in Los Angeles, as the Sparks battled the Minnesota Lynx in a five-game series. During one of the post-game press conferences, a media member who asked a question was gently ribbed by a WNBA staffer who obviously knew him. He said the reporter’s full name and I perked up; was that who I thought it was? Afterwards I made my way to the man and introduced myself. Sure enough, he was a well-respected, longtime former writer for a major daily newspaper. He was laid off, with many others, a few years ago as print sales had fallen drastically and the publication was trying to stay afloat. This brilliant writer now does freelance work and doesn’t clear $2,000 per month. I wish I could say this kind of scenario was an exception for journalists, but over the last 15 years, it has become the rule. The rise of the Internet has systematically reduced the profession, which for so long has been called the fourth branch of government, to a shadow of itself – and one that is on life support. In 2001, about 411,800 people worked in the journalism industry. By 2016, that number had dropped below 174,000. Between 2010 and 2015, newspaper print advertising revenue had fallen from $60 billion to $20 billion per year. A 2009 Columbia Journalism Review report concluded that “What is under threat is independent reporting that provides information, investigation, analysis and community knowledge, particularly in the overage of local affairs.” (Data provided by Richard L. Hasen, the Chancellor’s Professor of Law and Political Science at UC Irvine, from a forthcoming law review piece, “Cheap speech and what it has done to American Democracy). Cheap speech is also killing the livelihoods, hopes and dreams of journalists, as the ability of anyone to post anything has lowered the bar for the profession considerably. Many who have never had formal writing and/or journalism training are posting stories that read horribly, have an agenda beyond fair reporting, have no AP style or punctuation, and which are biased. Yet, these pieces float around on the Internet and drag down the reputations of good writers with them. This has resulted in a dearth of jobs for those trained in the journalism discipline. Traditional, ethical, fair journalism has lost ground to blogs and sites that provide “platforms” for any kind of writing; uncensored/inappropriate opinion; and “fan” websites on the sports side. Young journalists are seeing their careers stagnate, if they ever take off at all. They’re questioning their career choice, wondering what to do with their talents if they can’t use their strengths and gifts. Older writers are having the same issues, as there are scarcely any jobs to be had at traditional newspapers for us, either. And getting a freelance writing job that pays seems to be an act of God. The way it used to work was that if a writer showed her skill and knowledge, she would get somewhere. But it’s not nearly that easy anymore. In 2012 I pitched a a story to a large sports news entity and it was accepted immediately. Every story I pitched to them afterwards was rejected, until a couple years ago the editor finally told me that not only do they seldom do stories on female athletes, but that their freelance budget had been shaved to nothing. In other words, don’t bother to pitch. I had a similar experience with another sports publication, who for a while was paying writers only for stories published in the hard copy; they didn’t pay for pieces featured on their website. Eventually they opted to keep all writing assignments in-house, and no longer hire freelance writers. There is one major news entity that is like many others in that they don’t pay freelance writers, but they welcome anyone to keep a blog on their website. Similarly, I wrote a story for a new site a couple years ago, for which I received a check. Now they don’t pay writers anymore at all – they welcome anyone to “submit their story as a contribution to the platform,” according to an email I got from one of the editors recently. I don’t think so. I didn’t go through all that schooling and put work into my craft for the last 27 years to give it up for free. A writer friend of mine clued me in to a writing job page on Facebook. I found that the ratio of emailing pitches to editors and actually receiving a response was about 25-1 – discouraging odds, even for a vet. Everyone is competing for the same limited opportunities. Many other experienced writers I’ve talked to have had similar experiences finding paid gigs. Sometimes it feels like better luck would be had mining for gold. The situation is ironic because the public still relies heavily on news, as they always have. It’s just that now, no one wants to pay for it. And some organizations are having trouble understanding that news entities don’t have the budgets that they once did. The WNBA has bemoaned the lack of coverage from major news entities, but even ESPN laid off numerous employees earlier this year. Minnesota Lynx coach Cheryl Reeve criticized the Minneapolis Star Tribune for not sending a reporter to cover the WNBA All-Star game last month, which featured four of her players. The paper said they didn’t have funds to cover the cost of the trip, and I have no doubt that was true. If major online sites won’t pay for writers, traditional newspapers have even more meager budgets. It is a sad state of affairs for those of us who got into the profession because we love to find, research and tell stories. We did not become writers to get “clicks.” Yet here many of us are, and no one wants to pay us for our skills. I am big on solutions, yet for once, this problem-solver has no solution for this predicament. But know this, younger and older journalists everywhere: you are not alone. We live in a cheap speech world. The Sun topped the Mystics, 86-76, on a ridiculous statistical night for several players. Jonquel Jones had 14 points and 22 rebounds to become only the second player (after Tina Charles) to grab 20 rebounds in three games in one season. Alyssa Thomas had 26 points and 10 rebounds, and Elena Delle Donne had 24 points and 16 rebounds. The league's final regular-season power rankings have the Sparks on top. The Liberty are third and now the Sun are fourth. The playoff picture is still muddled, as the Sparks sit atop the AP poll. Lisa Leslie will coach the New Orleans Gators, which is part of a co-ed professional league. With playoff leverage on the line, the Lynx can't look too far ahead against the Fever. The Wings enter tomorrow's game against the Sky with a chance to make the playoffs for the first time since relocating to Dallas. Mercedes Russell has no regrets about returning to Tennessee. Cal State Fullerton transfer Iman Lathan has gone to Butler. Siena transfer Jackie Benitez has landed at James Madison. Maryville College guard Brittany Johnson was killed yesterday in a single-car accident. Maryland beat Sweden to finish fifth at the World University Games. DePaul's new basketball arena will bring big changes to campus. Dayton sent clothes and shoes to Houston flood victims. Keeshawn Davenport's contract has been extended at New Orleans. IUPUI coach Austin Parkinson's contract has been extended. Chanel Murchison is a new assistant coach at William and Mary. The WNBA is excited about their success on twitter, streaming to a global audience. Stanford coach Tara VanDerveer says TV exposure is a game-changer for women's sports. The Sparks are picking up momentum as the playoffs near. The Mystics are looking for a little rhythm and luck heading into the playoffs. WNBA BPI: Can the Wings make a playoff run? Interview with Dallas rookie Evelyn Akhator. The Lynx have signed forward Cecelia Zandalasini. Sun vice president Amber Cox is expanding the team's reach. Candace Parker and Tina Charles are the Western and Eastern Conference players of the week. Sun at Mystics.....rescheduled from the game postponed due to a leaky roof last month. The search is on to find Anucha Browne's replacement. NCAA leadership provides challenges and joys. Lady Vols Mercedes Russell and Jamie Nared share lessons from their U23 experience. Joanne McCallie's contract at Duke was extended through 2020-2021. Ashley Robinson is a new assistant coach at Penn. Former Texas A&M coach Wanda Bender died. The Liberty cruised past the Sky, 92-62, and earned a first-round playoff bye. The Sparks downed the Lynx, 78-67, and are now only a half game behind them in the standings. The Mercury slipped past the Storm, 75-71, and secured a playoff berth. Sue Bird didn't break the all-time assists mark; she's still three away. The Women's National Team will train in Santa Barbara, Sept. 30-Oct 2. 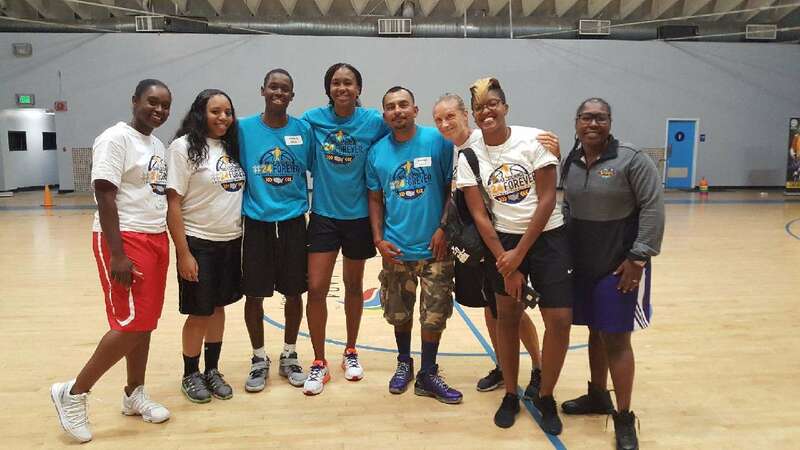 As basketball legend Tamika Catchings prepared to retire from the WNBA last season, she raised money in each WNBA city for youth as part of her "Legacy Tour." The deal was that she'd return to each city and conduct a fitness clinic, and this summer she's been doing just that. Friday afternoon, the Catch the Stars Foundation stopped in Los Angeles and visited the Challengers Boys and Girls Club. Tamika opened the camp with a talk and some instructions. Her first rule was to have fun. Her stipulation was that no one was allowed to say "I can't" for the duration of the clinic. Anyone heard saying those two words would have to do ten pushups. "Saying 'I can't' means you won't even try," Tamika told the kids. I smiled like a Cheshire cat as I had Pat Summitt flashbacks. Tamika led an icebreaker game that got everyone laughing. Then participants were lined up in age groups for a warm up. Before they began, she asked them how many WNBA teams there were. Everyone started throwing out guesses except a fourth-grader I ended up talking to for a while later, when she came through my station. This girl was looking at the back of the T-shirt on the person in front of her in line, where all the teams were listed, and she was counting them. "I'm using my resources," the girl explained when I asked her what she was doing. I told her to keep it up; that she would take over the world someday. We then broke out into five stations, where myself and four other coaches guided participants through drills and exercise for about an hour. Tamika's assistant told the woman running the layup station that No. 24 would probably find her way there first, because she's very particular about layups and how they are taught. Sure enough, that was Tamika's first stop. But she made it around to all the stations and jumped in for a bit to add to the instruction. Tamika is great with young people. She has a friendly, warm manner that is expertly mixed with high expectations. She puts kids at ease, yet pushes them to be their best at the same time. It is something to behold. Participants and coaches at the conclusion of Tamika Catchings' Legacy Tour Clinic Friday. 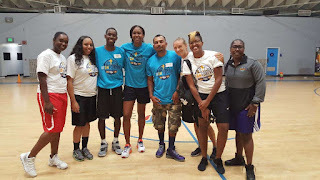 The coaches, with Tamika Catchings and an LA Sparks staff member, right. After the event Tamika talked to us coaches for a few minutes and then started cleaning up shop. She and her assistant knelt on the floor and repacked the leftover camp T-shirts into a USA Basketball suitcase that looked like it might have gone to both London and Rio. They left in their own rental car to go back to the airport. It is said that character is revealed by your actions when no one is watching. As Tamika always showed great character on court, she is exhibiting even more off of it. In her retirement from basketball, she's expanding the reach of her 13-year-old non-profit foundation to other cities, and she makes it happen with no fanfare. Los Angeles was the eleventh stop on part II of the Legacy Tour, as she has quietly visited other cities to bring awareness and raise money. She does it because it's the right thing to do. How many other retired professional athletes have chosen this career path? And one of the best that's ever played the game of basketball? I'd venture to say, not many. Last year, as her final season wound down, I was worried about missing Tamika on the court. For her hustle, her leadership, her selflessness, her statistical dominance in multiple categories, she is my favorite player ever to suit up for the WNBA, hands down. But last night after the clinic, I reconciled two things. The first was that Tamika will always be around. She's everywhere, has multiple projects in many places, and she is not the kind of person to just disappear into the sunset. She likes to help people. 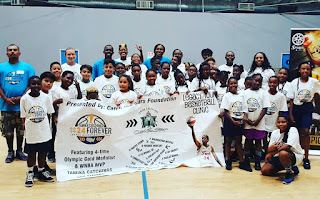 The second thing was that all the things Tamika used to do for fans with her intense drive and commitment, she now does for a different audience: kids. I can live with that. Donating to Catch the Stars is as easy as going here. The Dream edged the Fever in overtime, 79-74, to keep their slim playoff hopes alive. The Wings got past the Mystics, 83-78. Dallas has playoff hopes too. The WNBA is going to let teams choose how they stand for the National Anthem for the rest of the season. The Lynx are defending their postseason position with LA breathing down their necks. Chiney Ogwumike breaks down the Sparks' defensive prowess. The tired Sun are ready for a little break. Elena Delle Donne's Air Swoopes-inspired Nike Hyperdunk PE will release this fall. Who should win Rookie of the Year? Allisha Gray or Brittney Sykes? You can vote in my twitter poll. Lynx at Sparks.......this should be a goody. Jamie Nared says the Lady Vols have a completely different feel this year. South Carolina could play Notre Dame in the Gulf Coast Showcase Tournament Thanksgiving week. The Sky used a balanced approach to top the Sun, 96-83. The Lynx's 89-70 rout of the Stars secures their place in the playoff semifinals. Despite the return of Elena Delle Donne from injury, the Liberty beat the Mystics, 74-66. 'Fight, fight, fight, every day': Gabby Giffords speaks to fans at Phoenix Mercury game. Ivory Latta won the Dawn Staley Community Leadership Award. Her reaction to receiving the award was touching. Cappie Pondexter will be inducted into the Chicagoland Sports Hall of Fame. Sue Bird raised the 12th man flag for the Seahawks tonight. Bird is six assists away from becoming the WNBA's all-time assists leader. Tiffany Jackson-Jones is the definition of role model. Not a single WNBA star has a shoe line to call her own. UConn has reloaded with new faces. New court coaches for Women's National Team training camp this fall include Michelle Clark-Heard, Jennifer Rizzotti, Sue Semrau and Jeff Walz. .....now Los Angeles is only one game behind Minnesota. The Sparks ran over the Mercury, 82-67, as Diana Taurasi sat to rest. The Los Angeles Sparks aren't sorry. It's playoffs or bust for the Storm. Why Alana Beard should win defensive player of the year. Faced with one loss after another, Candice Dupree keeps it together. Jordan Hooper keeps shooting for the Sky in a roller coaster season. Sun rookie Brionna Jones likes getting physical. Kayla Pedersen and Connecticut are enjoying their winning ways. The Sky have signed Bashaara Graves for the rest of the season. Tina Charles is the main challenger for Sylvia Fowles as MVP. Time isn't on the Sky's side as they head into tomorrow's match up with the Sun. A new Title IX lawsuit against Baylor alleges failures after implementation of new policies. Billie Wilson is a new assistant coach at Towson. Pac-12 Networks: The inside story of the DirecTV impasse. Native American twins Kyarrah and Kyannah Grant are budding stars. The Sun topped the Wings, 93-87, for their first 20-win season in five years. Sancho Lyttle and Layshia Clarendon led the Dream past the Storm, 89-83, to snap a nine-game losing streak. The Liberty eased by the Fever, 71-50, for their sixth straight win. WNBA basketball power index: the Sparks are closing the gap on the Lynx. Minnesota is a joy on and off the court. Will the Lynx add top European forward Cecelia Zandalisini for their title drive? Isabelle Harrison tells her story. Bria Hartley has become the X-factor in the Liberty's surge. Sylvia Fowles and Cappie Pondexter join the Around the Rim podcast. Every game matters down the regular-season stretch. Basketball is tops for participation among college athletes. Monique Billings takes us on a video voyage of her journey with the U23 team to win gold in Japan. Megan Straumann is a new assistant coach at Harvard. Wanisha Smith is Towson's new assistant coach. Maryland/USA has advanced to the quarterfinals of the WUG. Coach Brenda Frese delivered an inspiring pre-game speech. The Lynx gave an all-around effort in their 105-69 thrashing of the Mercury. The Sparks took care of the Stars, 75-55. From almost first to almost worst, here's what happened to the Indiana Fever. In the league's weekly power rankings, the Sparks are back on top. Los Angeles also heads the AP power poll. Imani Boyette said she asked to be traded to the Dream. Sugar Rodgers feels at home on the driving range. Sun rookie Brionna Jones is learning from the veterans. Curt Miller and Cheryl Reeve are battling for coach of the year. As the playoff race tightens, Reeve has confidence in the team. The SEC schedule is out!! Oh happy day. South Carolina will encounter hurdles on the path to their fifth straight SEC title. Colorado State has two new assistant coaches. Glory Johnson was suspended one game for throwing a punch at Matee Ajavon during the Wings-Dream game Saturday. She'll sit for Wednesday's match up against the Sun. Glory Johnson has footage of the incidence, and some comments, on her twitter and instagram. Started a discussion thread on the topic on our Facebook page. If the playoffs started today, here's how the picture would look. The Phoenix Mercury trolled the Connecticut Sun with a great eclipse tweet. More on the Liberty's Unity game yesterday. New York is continuing their commitment to racial justice. DeWanna Bonner is busy with babies as the Mercury try to clinch a playoff spot. Lynx coach Cheryl Reeve sees her team weathering the storm. The Liberty look to keep their momentum going against the surging Sun. Briann January will miss the final two weeks of the season with a torn meniscus. Angel McCoughtry has no regrets about sitting out the season. Maya Moore is the biggest supporter of Sylvia Fowles' career year. San Antiono has signed Cierra Burdick for the rest of the season. Breanna Stewart and Tina Charles are the Western and Eastern Conference players of the week. Amber Cox has lifted Connecticut's popularity. Resurrecting the Sun has been an award-worthy feat for Curt Miller. Maryland cruised past Uganda in the opening round. Rhode Island has decided to postpone a Barcelona trip in the wake of last week's terrorist attack. The Sun pummeled the Mercury, 94-66. Connecticut wants that trophy. Watch out. They've also guaranteed themselves home court advantage. The Liberty used a strong fourth quarter to beat the Lynx, 70-61. New York clinched a playoff spot and have now won five in a row. Minnesota has lost four of their last six games. The Mystics nudged the Fever, 87-82, to clinch a playoff spot. Indiana is now out of the running, ending 11 straight years of playoff appearances. The Storm just quenched the Sky, 103-66. Those Seattle women are on fire since they changed coaches. Plenette Pierson will retire after this season. WNBA players aren't afraid to take a stand. In the NFL, things are different. Kia Vaughn shared a message on Unity Day: "let love win." The game showed that black and white players need to be on the same team. UConn lost the final game of their Italy tour, without an injured Napheesa Collier. Even today, girls are told that they should be quiet and sit down to allow space for the boys to take charge. That makes me so angry. I want our girls to know that who they are, just as they are, is enough. Too often, our strength is taught or discouraged out of us as we grow up, but it's like a muscle that needs exercise. The more you use it, the easier and more natural it becomes -- even if you have to start by pretending. While on the journey -- you can do this even as an adult -- start small by trying things you normally wouldn't and go from there. I hope that this message grows. I hope girls and women believe -- and retain that belief -- that they are amazing and strong and powerful. I hope our government hears this, and I hope my daughters and their daughters don't have to keep fighting this same fight. Women and girls are strong. That's not new. But convincing them that their strength has value and is worth expressing is something that can take some work. Beauty and power and strength come from being confident in your own worth, but it's a message that bears repeating. While every generation of girls is dealing with similar stereotypes, this generation of young girls are facing new pressures from the internet and social media to look, act and be perfect. No one is happy all the time, that no one's life is perfect, and we are all just in this together trying to figure it all out. Glory Johnson led the Wings past the Dream, 90-86, with 23 points and 13 rebounds. Dallas is sitting in the seventh spot right now, while the loss is Atlanta's eleventh straight. Look how tight these standings are right now. Life without Lindsay Whalen isn't so great for the Lynx. Skylar Diggins-Smith has Dallas one step closer to the playoffs. Allisha Gray should be a unanimous choice for ROY, coach Fred Williams says. Liberty players band together as MSG, team deliver anti-hate/unity message to America. WNBA players continue to be active on social issues. Mercury at Sun, where they look to avenge a one-point loss. The definition of a student-athlete is at stake in the North Carolina case. Maryland will represent the U.S. in Taiwan at the World University Games. Former USC guard Valerie Higgins has transferred to Pacific. Where was Jewell Loyd after last night's Storm win? Putting up shots. Brianna Turner is on the mend. UConn's Crystal Dangerfield is ready to step up in her sophomore season. The Liberty ended the Sun's winning streak at six, with an 82-70 win. The Mercury used a fourth quarter push to down the Mystics, 89-79. The Lynx thrashed the Fever, 111-52. It was the largest winning margin in league history. A short time ago, the Sparks won a double-overtime battle with the Sky, 115-106. Five in double figures on each team, and three with double-doubles from Los Angeles while Chicago had two dub-dubs. Insane. Still battling at this hour are the Storm and Stars. Our reporter will have a story soon. A career demanding perseverance has become rewarding to Candace Parker. The chemistry between the Dallas rookies is one of laughter. Rebekkah Brunson could miss the rest of the regular season after spraining her ankle in Wednesday's game. Keisha Hampton will miss the remainder of the season after having knee surgery. Jamaica has honored Simone Edward with the "Order of Distinction." Kristi Toliver talks about players' demonstrations of unity. The WNBA's handling of protests is better than the NBA's. 12 years later, Shawntinice Polk still brings out the best in her Arizona teammates. Quinnipiac coach Tricia Fabbri looks to build off the momentum from last year's Sweet 16 run. South Carolina coach Dawn Staley's mother has died. Past experience helps Big East Commissioner Val Ackerman grow the Big East Conference. How a failed Title IX lawsuit will have lasting impact on future cases. Legendary Eden Prairie, Minnesota coach Faith Johnson Patterson was asked to resign. For Sun players, the Charlottesville violence hits close to home. The Lynx are searching for answers after last night's loss to the Storm. Tiffany Mitchell will miss the rest of the season after tearing cartilage and bruising the bone in her right knee during practice last week. Learn more about Damiris Dantas. Michelle Snow has life after basketball mapped out. The NCAA vs. North Carolina heads to a familiar phase: waiting. After this morning's terrorist attacks in Spain, visiting Texas A&M is safe, as is Florida State. Destiny Bramblett is a new assistant coach at SIUE. Danielle Mauldin is Eastern Washington's new assistant coach. The Storm shocked the Lynx in a KeyArena takedown. Tiffany Hayes helps drive the Dream. A rested Angel McCoughtry eyes a return to hoops. Sylvia Fowles credits her stellar play to footwork and poise. Allie Quigley keeps adding to her remarkable season. Alysha Clark has won the WNBA Cares Community Assist Award for July. Why there's been a drop in female coaches under Title IX. After five years with the NCAA, Anucha Browne leaves for UNICEF USA. She will be missed. The Sparks cruised by the Mystics, 95-62, for their 20th win. And just moments ago, the Storm toppled the Lynx, 62-61. Sparks and Mystics players locked arms during the National Anthem tonight to protest President Trump's divisive stance and to honor Charlottesville victims. League president Lisa Borders issued a statement of support for players. A Jonquel Jones vs. Brittney Griner dunk contest will headline a food drive this weekend. Before their game against the Mystics, the Sparks visited the National Museum of African American History and Culture. They found inspiration in the visit. Another Connecticut Sun chemistry story, this time with an ancient photo from 1708. Nneka Ogwumike wants to make the WNBA a global brand. But how? Skylar Diggins-Smith, Imani Boyette and Brittney Sykes are featured on the latest Around the Rim podcast. Where does Brittney Griner rank in the MVP race in her return? Rookie of the year discussion. Brittney Sykes is making a strong case for ROY. Lanay Montgomery is adjusting to the pros. Alaina Coates is progressing through rehab. Stars talk about what makes the league fan-friendly. Storm interim coach Gary Kloppenburg is a quiet leader. Kansas Athletics will celebrate 50 years of women's sports. After nearly 10 hours, the first day of UNC's infractions hearing closed today. Coaches and administrators made UNC's case to the NCAA behind closed doors. South Carolina players supplied the motivation at a recent visit to the Department of Juvenile Justice. UConn continues their tour of Italy. The Sun routed the Dream, 96-75. Six Connecticut players notched double figures, including two from the bench. Jonquel Jones had her seventh consecutive double-double. It's the sixth straight win for the Sun. The Storm are hoping a coaching change can lift the team. The Lynx are forced to adjust to basketball life without Lindsay Whalen. A voice from above is helping Minnesota improve their three-point shooting. The league's power rankings for the week. Kaela Davis is learning to call Dallas home. How the 1976 Olympics shaped women's basketball. A full North Carolina vs. the NCAA primer. In the middle of the night today, the USA's U23 team won the inaugural Four Nations Tournament title with a 103-71 thrashing of host Japan. The Mystics' upcoming game against the Sparks could determine their playoff road. The Sparks and Lynx are taking their rivalry to another level. Los Angeles is sticking to the basics down the final stretch of the regular season. Brittney Griner, Layshia Clarendon wrote an op-ed speaking out against a Texas bill that would diminish protection of LGBTQ people. Read the text here. The Fever's Candice Dupree is a mom of twins in a family matter for the team. The sky is the limit for Dream rookie Brittney Sykes. The Stars have signed Cierra Burdick to a seven-day contract. Jonquel Jones and Sylvia Fowles are the Eastern and Western Conference players of the week. Freshman Azzi Fudd is in a class of her own. The Liberty dominated the Sparks, 83-69, for their third straight win. The Stars have rediscovered their winning touch. Kayla Alexander is a maestro in the paint, and with paint. Helping others is Shay Murphy's plan. San Antonio waived Erika de Souza. Saniya Chong talks about her first year in the league. Canada squeezed past Argentina, 67-65, to win the championship game. The U23 crushed Candada, 107-61, just a few hours ago at the Four Nations Tournament. The Japan Basketball Association twitter account provides live game updates. Jonquel Jones and Alyssa Thomas each had double-doubles to lead the Sun past the Wings, 96-88. Connecticut clinched a playoff spot because they won, and Atlanta lost. The Mystics routed the Fever, 100-80. The game, in D.C., was delayed by a leaking roof AGAIN, so players from both teams had a dance off. More humorous video. The Stars beat the Dream, 83-68, behind Isabelle Harrison's career-high 23 points. Atlanta is in free fall mode lately. The Storm downed the Mercury, 98-89, to snap a four-game losing streak and spoil Brittney Griner's return. The Minnesota Lynx unveiled their new logo last night. Shooter's paradise with Maya Moore. Morgan Tuck is shaking off rust with the Sun. Courtney Vandersloot is rising to the top. Who are the league's toughest players? The new coach of the Seattle Storm sees the playoffs on the horizon. An experienced roster must make up for lack of depth at Ohio State. Azura Stevens and Batouly Camara will make their UConn debuts in Italy this week. UTSA has fired coach Luby Lichonczak after four seasons and promoted associate head coach Kristen Holt to the position. The U.S. team plays Canada tomorrow morning at 12:30 a.m. Pacific. A third quarter surge propelled the USA over Australia, 78-60, just a few hours ago. I talk about WNBA marketing, the Sparks and more on this podcast. Epiphanny Prince led the Liberty past the Dream, 83-77. The Sparks held off the Lynx, 70-64. Boy, these playoffs are shaping up well. The Storm are looking to right the ship. The Sky are looking to win and build for the future at the same time. Alyssa Thomas has the Sun on the verge of a playoff spot. How Nneka Ogwumike got that body. Emma Meesseman is stepping up at the right time for the Mystics. Getting Zellous over Shavonte as the Liberty hit the playoff stretch. In a challenging rookie season, Nia Coffey remains upbeat. Leilani Mitchell is shining for the Mercury. Brittney Griner will return to the floor for Phoenix tomorrow. Who will be the next coach of the Seattle Storm? Choices abound. Under Armour has revealed the new UCLA basketball uniforms. Mississippi State's Final Four banner will be revealed Nov. 10. LaVonda Johnson has been terminated as Bowling Green High School coach. The Mercury outlasted the Wings, 101-100, in overtime. Heck of a game. The Sky routed the Stars, 94-74. Races to watch down the stretch. The Wings are keeping an eye on WNBA standings, with playoffs approaching. The Lynx will reveal their new logo for next year at halftime of tomorrow's game. Lynx center Sylvia Fowles has perfected the art of the catch. Fowles is staking her claim in the MVP race. Kaleena Mosqueda-Lewis is finding her way in the WNBA despite injury. Cappie Pondexter is among the greatest players in league history. What it takes to become the greatest scorer in WNBA history. Duke players in the WNBA update. What position does Aerial Powers play? You name it. The Storm fired Jenny Bouceck today. Assistant coach Gary Kloppenburg will be interim head coach. Will this change inspire the Storm to make the playoffs? Minnesota and LA will meet in another high-stakes game. The Lynx are drawing motivation for the match up from injured Lindsay Whalen. Dawn Staley's Gamecocks will play her former team, Temple, this December. They are giving back to the community. South Carolina fans will see some changes this season. Texas is mixing business with fun on their Italy trip. Schedule switch for UConn: they'll open with Stanford. Maryland has received a verbal from a top-ranked 2019 recruit. The team won their first scrimmage today, against Australia, 78-63. An elite Texas player was inspired by an NFL running back. The Mystics' Monumental Sports and Entertainment, along with Capital One, have announced a new arena naming rights partnership. Glory Johnson is taking the Wings to new heights one rebound at a time. The Lynx are confident in Renee Montgomery and Alexis Jones stepping up for Lindsay Whalen. Brittney Griner says every time she's been broken down, she comes back stronger. The league's MVP contender list. Pokey Chatman has the Fever ahead of schedule. South Carolina was tops in attendance last season. Syracuse more than doubled their attendance. Maryland is ready for a "business trip" to the World University Games. UTEP transfer Lulu McKinney has landed at Texas A&M. UCF has extended Katie Abrahamson-Henderson's contract through 2022. Teresa Phillips is Tennessee State's new athletic director. The Liberty got by the Fever, 81-76. Erica Wheeler scored a career-high 33 points for Indiana. The Sun adjusted to beat the Storm, 84-71. Courtney Williams put up a career-high 27 points for Connecticut, and Sue Bird became the league's all-time leader for career starts, with 471. The Lynx bounced back to top the Dream, 81-72. The Sun will have to play without Jasmine Thomas for a while. The Liberty has partnered with RISE to host the first unity game at Madison Square Garden. ESPN predicts the Lynx will top the Sparks Friday. Brittney Sykes' stellar season has put her in the rookie of the year conversation. A purple pen has helped Kelsey Plum blossom. Skylar Diggins-Smith and Dallas are ready for a playoff push. Diggins-Smith is the new brand ambassador for Puma. Shatori Walker-Kimbrough's role is growing with the Mystics. Kelsey Plum is the AP's player of the week. NCAA Division I attendance eclipsed 11 million for the tenth straight year last season. Michigan State's Shay Colley is playing in the FIBA Americas Women’s Championships in Buenos Aires, Argentina for Canada. Former Virginia Tech coach Bonnie Henrickson is enjoying life as coach at UC Santa Barbara. Briann January is looking ahead to the winter when she'll be assistant coach at Arizona State. Shannon Johnson-coached Coker will face the Gamecocks in an exhibition game this fall. MTSU celebrated Rick Insell's induction into the Hall of Fame earlier this summer. Illinois State coach Kristen Gillespie says her team is playing at an elite level. Podcast: U23 coach Jeff Walz. The Dallas Lightening won the inaugural title game of this minor league. The U23 team is readying for the inaugural Four Nations Tournament. They leave for Japan tomorrow. Video highlights of today's practice. Princeton coach Courtney Banghart is one of the team's assistant coaches. The Sun are hot with Alex Bentley's new role. Courtney Vandersloot and Glory Johnson are the Eastern and Western Conference players of the week. UConn's Napheesa Collier is impressing her skills coach with her offseason work. Jody Wynn is remaining upbeat despite some early challenges at Washington. UConn associate head coach Chris Dailey will receive the Margo Dydek award at tomorrow's Sun game. She's getting a lot of love from the Husky community. The Mystics bounced back with an 85-80 win over the Mercury. The Wings upended the Sparks, 85-79. The Fever stunned Minnesota, 84-82. The Wings are coming together in time for a serious playoff push. It's been a career week for Kayla Alexander. The U23 team is readying for the inaugural Four Nations Tournament. The Sky rallied to beat the Dream, 91-86. Courtney Vandersloot had a career-high 26 points and 10 assists - her fourth straight game with 10-plus points and 10-plus assists. The Stars beat the Storm, 87-80 in overtime, for their third consecutive victory. Kelsey Plum led San Antonio with a career-high 23 points. Breanna Stewart had 32 points, eight rebounds, four assists and four steals - the first player since Candace Parker in 2014 to do so. A'ja Wilson can't play with the U23 team in the World Cup due to a groin strain, so Linnae Harper will replace her.